Dream Animals: A Bedtime Journey | What is ML Reading? I know I already posted an entry today; but we read another winner this evening. 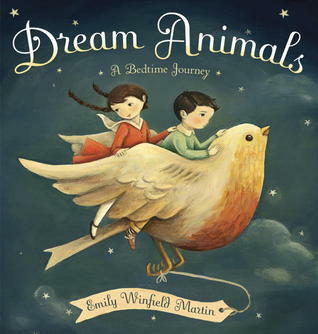 ML gave Dream Animals: A Bedtime Journey by Emily Winfield Martin the best compliment a picture book can receive. “Can we look at all the pages again?” Then, “Let’s look through the book one more time.” I could tell this wasn’t an instance of trying to stall bedtime. ML was mesmerized. Animals deliver children to their dreams. ML couldn’t choose between riding a red fox under the roots of a tree where fairies and elves play instruments… or diving on the back of a narwhal to a mermaid tea party. My dream choice was riding the moth to the crescent moon and painting stars in the sky. This book ends with the same words my mom said to me every night growing up. I say them to Mary Louise… Sweet Dreams! This entry was posted in Picture Book and tagged Dream Animals: A Bedtime Journey, Emily Winfield Martin by mlreads. Bookmark the permalink.